The Cook County Democratic Party on Monday unanimously re-elected Joseph Berrios to a sixth term as its chairman. In addition, the party unanimously re-elected its eight other officers – Toni Preckwinkle, executive vice-chairman; Lou Lang, executive vice-chairman; Tim Bradford, first vice-chairman; Carrie Austin, city vice-chairman; Don Harmon, suburban vice-chairman; Robert Martwick, secretary; Antonio Munoz, treasurer, and Karen Yarbrough, sergeant-at-arms. 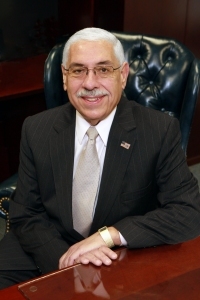 “Thank you for another opportunity as well as your confidence in the work we’ve done and will continue to do,” Berrios told the committeemen after his re-election. Following the re-election of the other eight officers, Berrios said “They will continue to participate and work very hard.” The Cook County Democratic Party is made up of 50 Chicago Ward and 30 Suburban Township Committeemen whose offices are non-paid positions. The nine officers make up the party’s executive committee.